Subra Kumaraswamy is the VP of Security Architecture and Engineering has over 25 years of industry experience in product engineering and cybersecurity. He joined Visa in 2015 and leads key initiatives including Product Security Engineering, Application Security, Data protection, Shift-left, Artificial Intelligence for threat management, and next-generation security architecture. Prior to that he has held leadership roles at Apigee (acquired by Google), Intuit, eBay and Sun Microsystems and delivered secure commerce services at Internet scale. 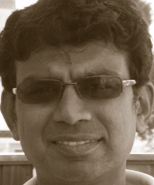 Subra is a frequent speaker on the topics of application security, identity, cloud and mobile security In his spare time, Subra researches emerging technologies including cloud computing, social networks to understand the security and privacy implications for users and enterprises. Subra is one of the authors of Cloud Security and Privacy, which addresses issues that affect any organization preparing to use cloud computing as an option. He's a founding member of the Cloud Security Alliance as well as cochair of the Identity & Access Management and Encryption & Key Management workgroups. Subra has a master's degree in computer engineering and is CISSP certified.